Recently, I watched one of my favourite films, A League of Their Own. If you’ve not seen this film and have a penchant for all things 1940s, I suggest you high-tail it to your nearest video shop and rent it or borrow it from someone who has it in their collection. Starring Geena Davis, Tom Hanks, Madonna, Rosie O’Donnell, and Lori Petty, I promise it will not disappoint. After watching the film, I looked at Geena Davis’ IMDB Profile to discover that today is her 59th birthday. I always like to look at actors’ profiles to see if they have any films I might not have seen. I’m ashamed to admit that I’ve still not seen what I am lead to believe is Davis’ best work, Thelma & Louise, but I was only 7 when that film was released back in 1991. Sure, I was only 8 when ALOTO was released, but I think the themes were a little easier for a girl of my age to grasp. Davis’ performances as the mother in both Stuart Little and Stuart Little 2 are also fabulous (did you know she was heavily pregnant while filming Stuart Little 2!?). Briefly, A League of Their Own is a fictional story based on true events in 1943 war-time America. Oregon sisters Dottie Hinson (Davis), and Kit Keller (Lori Petty) work at a local dairy while Dottie’s husband and the other dairy workers are off at war. Dottie and Kit are also members of the dairy’s softball team. With all the men off at war, America’s professional baseball league is in dire straits. Team owner and influential businessman Walter Harvey realises he needs to revive America’s greatest game or baseball will die. Harvey sends scouts all over the nation to find women to play in his new baseball league. Dottie is scouted by Ernie Capadino (Jon Lovitz), but doesn’t want to join the league. Kit wants nothing more than to get out of their home town as all she sees herself as is “Dottie’s sister”. Mr Capadino says Kit can come as long as Dottie comes too. Without giving too much away, Dottie and Kit make the cut for the Rockford Peaches, one of four original All-American Girls Professional Baseball League teams. The Peaches’ manager Jimmy Dugan (Hanks), former Chicago Cubs great turned drunkard, thinks the league is a joke, spending most of his time sleeping in the dugout while the Peaches take the country by storm. Last year, my friend celebrated his birthday in a Melbourne CBD park. The dress code consisted of wearing a funny hat. I didn’t have one in my collection, so instead opted to wear my Tottenham Hotspur baseball cap as I knew my friend would find it funny given he’s an Arsenal fan (the clubs are arch rivals in England’s Premier League). But, I hear you ask, what on earth does this have to do with A League of Their Own? 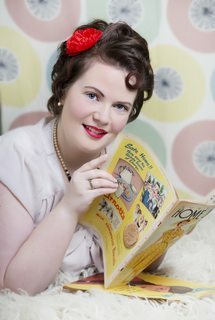 It hadn’t been particularly long that I realised my love for all things 40s and 50s (turns out I’ve always loved them, but was too afraid of what others thought. Then I grew up a little). I was nowhere near as adept at hairstyling then as I am now and my hair was not particularly long however I yearned to style my hair the way in which I recalled the baseballers in A League of Their Own. I didn’t get any photos of my hair under my cap at my friend’s celebrations as it was quite hot and the style didn’t hold, but in my mind, I dreamed of a style like “All The Way” Mae’s (Madonna) or Evelyn’s (Bitty Schram). All images linked back to original sources.